Applications are now open for Step into the Gap 2019. CAFOD believes in equipping and inspiring young adult leaders to be able to contribute to a more just and peaceful world. 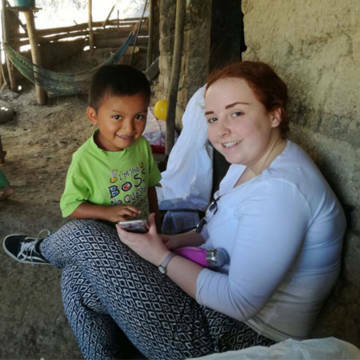 In partnership with our UK placements we offer opportunities for 18-30 year olds to gain experience, develop leadership skills and spend a year in the service of others. This allows them to inspire a generation of people to act for the poorest and most marginalised. 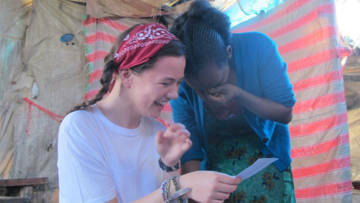 Why not do your Catholic Gap year with CAFOD? Applications for September 2019 are now open. By being in either a retreat centre, university chaplaincy or school chaplaincy you can volunteer as part of a programme which works alongside the Catholic community and others to bring about a more just world. This programme includes a visit to CAFOD partners and the communities we work with overseas. Download our application form for 2019. Download full details about the UK 2019 placements. Will I get paid and will I have to pay for anything? You won’t be paid a salary. You will receive regular money for your basic living expenses.The amount depends upon the placement you choose. Training, accommodation, travel (related to work), vaccinations and visas will be paid for. Food, accommodation, equipment and insurance for your overseas travel will also be provided. You may wish to purchase your own contents insurance for your UK accommodation. Fundraising for CAFOD will be part of the work in your UK placement team. The first stage is the application form. For those who are shortlisted, there is a recruitment day which will include an individual interview, a group exercise and the opportunity to meet members of staff at your chosen placement. You will be working in a Catholic environment and must be comfortable engaging with people around faith issues. You don’t necessarily have to be Catholic but you should be able to demonstrate your understanding of the Catholic Church or be open to learning more about it. The programme lasts for an academic year (usually September to July). You will normally work to the academic timetable with holidays at half term, Christmas and Easter. Can I volunteer for just part of the year? No, the programme is designed as a year long process. Will I be able to get a job with CAFOD or my placement team when I finish? There is no guarantee of employment at the end of the year, but you will certainly have gained a lot of relevant skills and experience. What will I be doing in the UK and where will I stay? This depends on the placement that you choose. Please read the placement information carefully and look at the placement websites to help you decide which placement would suit you best. What support will I get during the year? On a day to day basis you will be supported by the staff and team at your placement. You will also meet regularly with a local member of staff from CAFOD and be offered support from specialist CAFOD staff in Head Office. What if I start but find that I don’t enjoy it? We will work together to try to sort out any problems. If you find that it’s just not right for you then we’ll support you as you decide what to do next. If you leave straight after the overseas trip you may be asked to repay some of the costs. If I love it, can I do it for a second year? No, Step into the Gap is for one year only, so that as many people as possible can have the opportunity to experience it. International visit - what’s it all about? Visiting our partners and their communities in another country is an opportunity to experience some of the opportunities and challenges that they live with. You will get to share your stories and listen to theirs, work alongside our partners, eat with local communities and worship in a unique way. When you come home you will then use your experiences to inspire others to act for positive change and make a difference in the world. We’re pretty sure you’ll make some great friends along the way too. What country will I visit and do I get to choose where I go? No. The country that you visit will depend on many different things such as what type of work our partners are currently doing and which countries are safe to visit. Will I get training and will I have to pay any training costs? We will make sure you’re well prepared for your trip, helping you with everything from mosquito nets to media training, water to work plans and everything in between. All of your training will be provided by and paid for by CAFOD. What will I be doing overseas? This very much depends upon the country you visit, the partners you’re working with and your skills and interests. You could find yourself singing nursery rhymes with toddlers, sharing ideas about young leadership, visiting water projects or healthcare clinics. At CAFOD we take our responsibility for your health and safety very seriously. We provide you with training before you go and support while you’re overseas. A member of CAFOD staff will travel overseas with your group and will take overall responsibility for safety and security whilst you’re away. Catch up with blogs, films and stories from this year's gappers, and gappers from previous years!